Improving or even assuring the quality of our future societies will depend largely on the knowledge generated to address challenges of sustainable development. 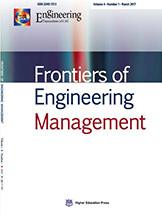 Therefore, the American Society of Engineering Management (ASEM) and the Department of Engineering Management of the Chinese Academy of Engineering (CAE) are collaborating on the creation of a special issue on Sustainability that will be published in Frontiers of Engineering Management (FEM). The problems related to sustainable development are complex. There is a need to consider multidisciplinary issues of three categories: economic, ecological (environmental), and social sustainability. The challenges of sustainable development may include identifying critical metrics, justifying the collected data, balancing the metrics in these three categories, and defining policies for international societies. The approach to these questions may need the clarification of accountability, the improvement of predictability and balanceability, and the articulation of policy-making in support of the development of sustainable systems. Therefore, this special issue welcomes papers which include, but are not limited to, problem-solving of practical cases, exploration of innovative algorithms, and development of new ways of approaching these complex and dynamic issues. All papers have to go through a double blind review process before final acceptance.